Are you getting serious about saving money? 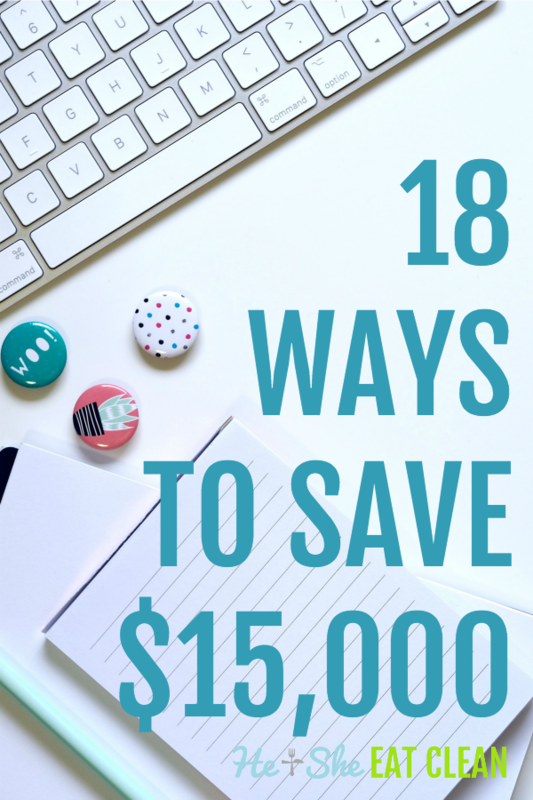 This will guide you through 18 ways to save $15,000. It’s never too late to start saving! Make it difficult to overspend – carve out a day each week (for example, No-Spend Mondays) to avoid spending frivolously on things you don’t necessarily need to collect or consume (excluding crucial recurring expenditures like gas, bills, groceries, etc.). Have this same day serve as a time to complete your financial review to help you avoid impulsive purchasing. Track your spending using a site like Mint. There are several websites and apps out there, but we’ve used Mint for many years and highly recommend it due to its simple approach to budgeting. Now, if you are looking for ways to save even more money you are in the right place! Below is a list of 18 ideas to help you save $15,000! If you really want to step up your game, join our Detox Your Life Challenge! Also, join us on Instagram, Pinterest, and Facebook for more tips! A single person making $40,000 annually and setting 6% of their pay into a 401(k) will save approximately $500 in taxes by utilizing the tax deferral and will receive $1,200 in “free money” assuming the employer matches 50% of the 6% contributed. This means that your out-of-pocket contribution of about $1,900 per year is actually worth $3,600. Speaking of taxes, here are 5 smart ways to use your tax refund. List items like furniture or other items of significant value on Facebook Marketplace or Craigslist. If it’s something small and you’re not worried about shipping, list it on eBay and start racking up on cash to help you reach your savings goal. Take clothes you wear less than once a month to your neighborhood consignment shop (we’ve had great luck with Plato’s Closet) if they’re not worth anything on eBay. A great starting point is this checklist of 10 things to get rid of for a clutter-free home. You can also take part in our 30-day minimalism challenge. Our story coming soon on how we earned over $8,000 by decluttering and simplifying our home. It’s okay if you want to engage in social activities a couple times a month for big celebrations (friends or family birthdays, closing a big deal at work or delivering a high-quality project/presentation to your boss), but it’s not necessary to hit up the bar or pub multiple times a month just to unwind after a long workweek. Instead, go for a hike on the weekends and unwind with nature – several new studies are showing time in nature is beneficial for your mental and emotional well-being. Read about our hikes here. Check out these 6 tips on how to save while dining out. Boutique gyms like your local CrossFit or Orangetheory are very taxing on your wallet. Instead, try out one of our workout plans and shoot to spend no more than $40/month on a standard gym membership (Orangetheory unlimited and CrossFit are about $150/month on average). We just transferred to Workout Anytime after waiting to secure the best deal and paid $420 for two years total for the Friends & Family plan – that’s only $17.50/month for both of us!!! We have a ton of free workouts on the website and also offer workout plans that cost less than the price of one session with a personal trainer! 5. Ditch the dish or cut the cable! If you need more to watch than Netflix or Amazon Video, go with SlingTV or PlayStation Vue (if you have PlayStation). According to our research, the average cable and satellite TV plans cost more than $120/month. Compare that to SlingTV’s plans of $20-$40/month or PlayStation Vue’s plans of $40-$75/month and you can save big! Why waste time watching Netflix when you can turn your free-time into easy cash by taking online surveys? Check out this website for the best survey offers. 7. Seriously, it’s time to kick Starbucks to the curb…and this is more than financial! I buy some really great 2-pound bags of organic coffee beans at Costco (or 5-pound bags on Amazon) for only $9 when they’re on sale, which works out to only 24 cents for a strong 12-ounce cup of coffee. 24 cents!!! Compare this to the average $3.25 spent daily on coffee from Starbucks and you spend about $1,200 annually versus $160 (incl. coffee grind and brew machine) for good, freshly ground organic coffee from home. And, no, don’t use a Keurig either! Here are some reasons why. Quit dining out for lunch and eat at your desk – you’ll be more productive and save money. You may even be able to leave earlier on Fridays thanks to the increased productivity. Plus, you can eat much healthier by making your own lunch! We have a ton of recipes that you can make and take for lunch! Grocery and warehouse stores are laid out in a way to make you spend impulsively. If you have a Costco membership then you know this concept all too well! Whitney will carry something in her hands around the store to determine whether or not she really needs the item (psychologically, it makes perfect sense). You can try this approach or simply challenge yourself to pull three things you don’t need from your grocery cart at checkout each week. Speaking of impulse buying, shopping online is even more dangerous given how simple it now is to place an order with a couple clicks and have it at your door within 2 days. If you’re considering making an online purchase that is more than $50, wait 48 hours before making the impulse buy. If you have a serious problem with online shopping, remove your stored credit card information from your browser and delete your account. Chances are you will avoid making the impulse buy if you make it more difficult to make a purchase by adding barriers. Appetizers and desserts add up significantly over the course of dining out throughout the year and they’re completely unnecessary. If you must have a dessert, always share – it’ll fatten up your wallet and slim your waistline! Find $200+ worth of items you purchase on a monthly basis, such as personal care products, cleaning supplies, coffee, pet food, supplements, groceries, etc. and put them on Amazon’s subscribe and save to earn 15% off and save at least $30/month. Our list of what we buy on Subscribe & Save is coming soon! Learn more about Subscribe & Save here. 14. Simple vehicle maintenance translates to easy savings! Inflate tires to proper PSI (or even 1-2 PSI higher than recommended), reduce your speed by 10mph, turn off the A/C whenever possible, roll your windows up and turn on the vent on the interstate and you’re on your way to saving big on your fuel bill. Shop around for the best car insurance rates and save big! Learn more here. Also, ask if there is a discount if you pay in full. We get a significant discount on our auto insurance by paying for a full year. Sure, LED bulbs are much more expensive than incandescent or even CFL bulbs, but the extended life of LED bulbs will more than offset incandescent bulbs if you use them for more than three years. The savings in energy costs will really add up if you start to change a large number of the commonly used bulbs. You can find this at most home improvement stores or on Amazon. If you are a drinker, keep track of how much you spend on buying drinks while dining out and also how much you spend when you pick up a bottle of wine or a six-pack at the grocery store. See these numbers can be really eye-opening! What should you do with your savings? Thanks, Michelle! Anytime is a good time to start saving and investing but the new year provides a fresh slate! I am doing most of these on my own, but I haven’t invested any money yet. thanks for the article. Or where would you recommend starting for inventing/gaining assets? ADMIN RESPONSE: Hi Abby! I would say opening a Roth IRA with Vanguard would be a great place to start. The few times I’ve had to contact them they were very helpful! I would call them or see what kind of information you can find online. We started with most of our assets in the Vanguard S&P Fund but you would have to determine how risk averse you are and how long you want to invest for. Thanks for the kind words about the blog too. 🙂 Let us know if you ever have any other questions!